Gary Louris, co-founder and longtime main man of the much-loved Jayhawks has also been much in demand over the years as a co-writer, working with the likes of Natalie Maines and The Dixie Chicks, Carrie Rodriguez, Scott Thomas, Jakob Dylan and Ari Hest. Studio album number 10 sees Louris, with the exception of two new songs, reworking some of these songs for The Jayhawks. Louris co-wrote four songs with The Dixie Chicks on their 2006 Grammy award winning ‘Taking The Long Way’ and two of those songs are featured here, ‘Bitter End’ and ‘Everybody Knows’. It can be difficult when listening to new versions of well-known songs to avoid making comparisons with the original recordings, especially when those recordings feature such a distinctive voice as Natalie Maines. Dixie Chicks fans will notice very little change in style or emphasis in these tracks and both sets of fans will no doubt form their own judgement on which they prefer. An undoubted album highlight is ‘Come Crying To Me’, a song that featured on Maines’ 2013 solo album ‘Mother’ and here features Karen Grotberg on lead vocals. Grotberg takes up the Maines challenge and meets it head on in this wonderful opening track that features a great groove and soulful horn section arranged by David Ralicke. ‘Backwards Women’ was written with Wild Feathers but never recorded, which is strange to fathom when it sounds as good as it does here. Honky-tonk piano helps drive a relentlessly upbeat and up-tempo song that is classic Jayhawks. The two new compositions are worthy additions to The Jayhawks’ catalogue. ‘Carry You To Safety’ is a grower, with soaring background harmonies that will repeatedly replay in your head when least expected, while closing track ‘Leaving Detroit’ is a slower paced, albeit somewhat sombre way to end the album. Piano led, reflective vocals rise to a chorus crescendo with lyrics bordering on dark and brooding, yet proving for the umpteenth time that these are no barriers to delivering a great song. 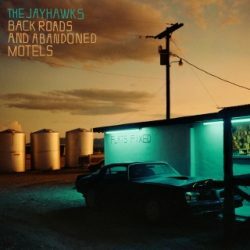 A return to some older tracks that may, or may not, be familiar to Jayhawks aficionados may divide opinion and there are a couple of songs that fail to live up to the high expectations that this band have now created for themselves. That aside, there is still plenty of high-class Americana on display here that will reward both old and new Jayhawks fans alike.